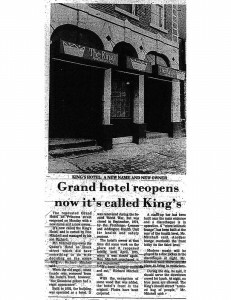 Street Address : 76 Princess St.
On March 1, 1977, the Kingston Whig-Standard ran a story announcing the opening of the King’s Hotel, a new bar situated right downtown on Princess Street, where the Toucan currently stands. In its former incarnation as the Grand, it had been one of the working class bars where gays and lesbians were “tolerated or at least not noticed”. New ownership and the accompanying renovations were heralded by the Whig as a vast improvement. “That was the hot spot,” recalls Harvey, “it was the Studio 54 of Kingston.” Owner Richard Mitchell expected that the King’s would draw “a mixed bag of people”, but on the King’s opening night it became apparent that Mitchell’s “mixed bag” did not include homosexuals. The QHA protested Mitchell’s actions on the grounds that they were both anti-gay and sexist. Subsequent phone calls to the King’s established that Mitchell had no intention to change his policy except to apply the rule to women as well. In response, members of the QHA decided to organize a picket. On Saturday afternoon, March 12, betweens 25 and 30 gay people and supporters gathered on the sidewalk outside the King’s to protest the owner’s actions. Picketers held signs that read “The King’s is sexist”, “Anti-gay is sick”, “discrimination lives here” and “gay is proud”, and the action attracted some 130 spectators, who stood quietly watching from the other side of the street. A reporter from the Whig interviewed protesters and the next day a photo of the protest appeared on the front page of the paper. Picketers recall that the beginning of the protest, when numbers were still small, was frightening because the protesters felt conspicuous, and indeed the Whig quoted one 14-year-old girl as commenting that she “can’t believe people would get up on Princess Street and admit they’re gay”. In addition, not all QHA members agreed with the protest, which they felt attracted negative attention rather than promoting the organization’s efforts to create a supportive environment for gays and lesbians. According to Harvey, the QHA felt the repercussions of the picket for years afterward. Anxious callers to the Gay Rap Line would express a fear of being on the front page of the paper if they joined the QHA. Unfortunately, the protest appeared to have little effect on the King’s except to cause Mitchell to declare that he would no longer serve members of the QHA “if I am able to recognize them”. Although the action did not change the King’s policy, the fact that thirty people openly and without shame or incident demonstrated for gay rights on a busy Kingston street was a formidable accomplishment.